יִגְּדַל אֲלֹהִים חַי - Exalted be the Living G-d. This song of uncertain authorship summarizes the 'Thirteen Principles of Faith' expounded by Rambam [Maimonides] in his Commentary to Mishnah (Sanhedrin ch. 10), and stated succinctly in the Ani Maamin prayer (p. 194, see commentary there). They comprise the basic principles of Jewish faith. In the Rambam's view, to deny any of them constitutes heresy. Although this song is printed in most Siddurim, many congregations follow the view of the Arizal that is not be recited. Why was it the position of the Arizal that Yigdal not be recited? The Wikipedia page I cited mentions that it was the Arizal's opinion that Yigdal not be recited, as the prayer it omitted in his siddur. However, it does not mention why. The MaVar YaBok brings that The Arizal was particular not use anything from the Achronim (not in our sense of the word rather later authorities ,not sure the starting point),rather only use prayers from the Rishonim who understand formulation of prayer and would not make errors. He actually singles out Yigdal specifically (assuming the reason is because of its late authorship. Sefer Masos Kapay quotes the Siddur Hageonim Vihamekubalim that the Arizal insisted on only saying piyutim authored by Rishonim because those could be trusted to be al derech haemes, but the later generations didn't understand kabbalah sufficiently to author well-written piyuttim. Another possibility is that he didn't consider the author worthy of composing a piyut. 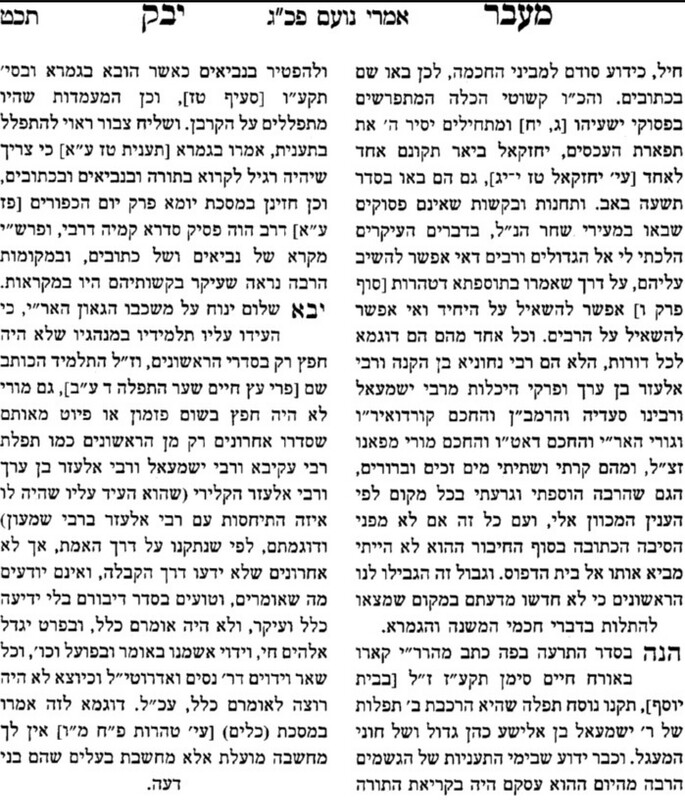 Shulchan Aruch 307:16 speaks extremely negatively about the (probable) author of Yigdal's other works and strongly discourages reading them, labeling him a machatee es harabim. Rabbi Soloveitchik is quoted in Nefesh Harav pg 231 as saying that it violates the principle mentioned by the Ramban in Re'eh that one should not serve God in a similar way to that of idol worshipers. Since the Catholics have a catechism which summarizes their main beliefs, it is forbidden to summarize our main beliefs in a single hymn. Not the answer you're looking for? Browse other questions tagged sources-mekorot shacharis-morning-prayer arizal . Why is “Av haRachamim” said every Shabbat?